No place in Vietnam has many beautiful and mysterious caves like in Halong Bay. Because of the unique original beauty in these caves, Halong has attracted countless travelers inside and outside the country to visit and admire. The following is the list of the most beautiful Halong Bay caves you should visit if you have the opportunity to come here. Trinh Nu cave with the system of caves such as Sung Sot, Dong Tien Lake, Luon Cave is located on Bo Hon Island, about 15 km from Bai Chay - Halong Bay. In the past, the French came here and called this cave as Girl Cave (La Vierge), and then the Vietnamese called it as the Virgin Grotto. The name of the cave is derived from the anecdotes of a couple's love story. This love story is beautiful but has a sad ending: The girl died, petrified and rested in a cave with her eyes pointing to the far side, toward where the boy is. Opposite the Virgin Cave is the Boy Cave. According to this story, it was the place where the boy laid down. If you travel to Halong Bay and visit the Virgin Cave, you will certainly hear the different "version" of this love story. Occasionally, visitors may hear murmurs, murmuring from cliffs. People think that is the scream of the boy towards the girl. Today, visitors coming to the Virgin Cave, can enjoy the opportunity to hear the legend, the story of the cave name, and also admire the beautiful scenery of this mysterious cave. The couples consider it as the symbol of a faithful love and the fishermen see it as an ideal stopover on the water of Halong Bay. The Virgin Cave is one of the most beautiful Halong Bay caves. Sung Sot Cave is considered one of the most wonderful Halong bay caves. 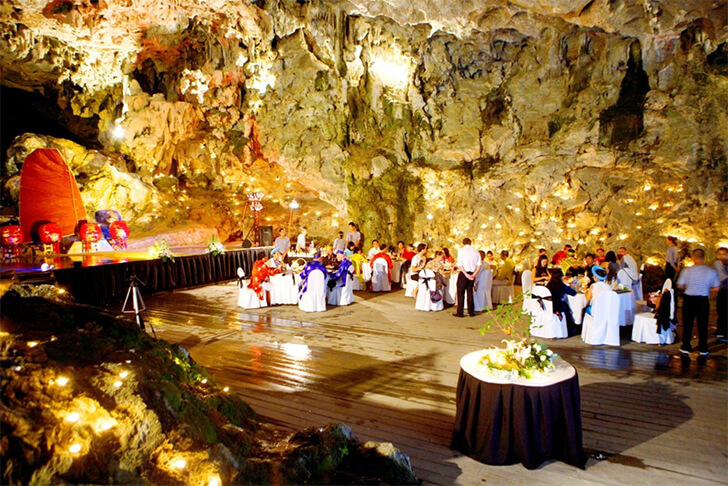 Sung Sot Cave is located on the island of Bo Hon, in the central area of Halong Bay. Every year, a large number of travelers want to admire the beauty of this cave. Before going to Sung Sot Cave, visitors will have to go under the thick forest foliage and the grafted rocks. 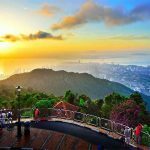 The tourists will experience the extremely interesting feeling of climbing. 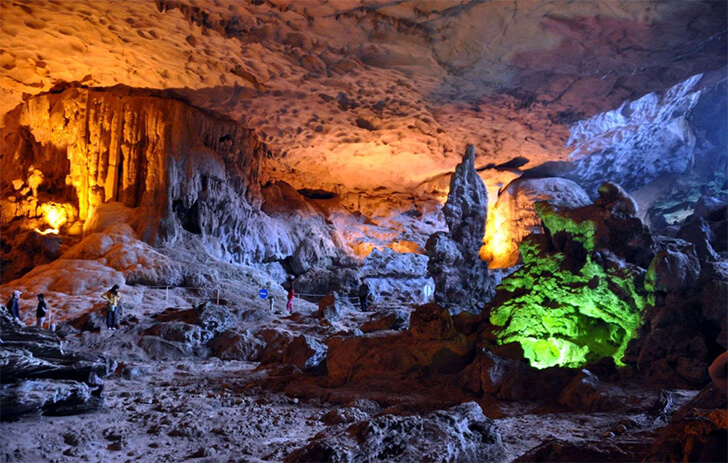 Sung Sot Cave is approximately 10,000 square meters, with two main compartments. Its head is like a large and wide theater. The ceiling is covered with "velvet carpet" and a lot of "light beams" hanging with light and shining color. In the cave are many stone statues, stalagmites with strange shapes creating a more mysterious atmosphere. Entering the cave, visitors feel like they are lost in the fairytale. Passing from the first compartment, the visitors will enter the second compartment through a small walkway. This area is large enough to accommodate thousands of people. Inside this one, the scene is so strange and extremely unique that makes anyone who has witnessed it feels startled. In this modern time, there exists a wonderful, natural beauty. The French called this place as "Grotte des surprises" – the Cave of Surprises, probably because of the great beauty within the cave. 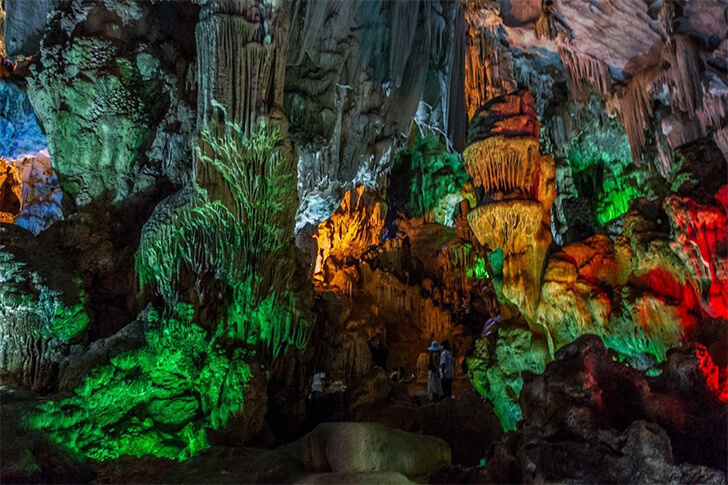 When visiting Halong, be sure to explore and admire the "unique" beauty of this cave. Dau Go Cave is also known as Giau Go Cave. One of the myths to "explain" this name is that this cave used to be the hiding place for ironwood piles to prepare for the battle against the Mongol invaders of General Tran Hung Dao. Dau Go cave looks majestic, calm and beautiful as a painting which is decorated with miraculous masterpieces. The book called Merveille de Monde (World Wonders) of France, specializing in tourism and introducing the famous landscapes in the world, published in 1938, considered the Wooden Stakes Cave as “Grotte des Merveilles” (Cave of wonders). It is said that Dau Go Cave is a place where ancient art and ancient stone pillars, rock pillars, small stalagmites and soaring rocks are gathered. It is wonderful when the middle of the poetic water of Halong Bay appears a beautiful and unique cave. Visitors must go through 90 steps to reach the cave. The cave has 3 main compartments with the cave arch of about 25m high and many stalactites from the arch of the cave that look like an extremely strange stone fountain. Standing under the dome, visitors feel like standing in a magnificent and shimmering castle with a huge architecture. Visitors cannot ignore the opportunity to visit Dau Go Cave in the list of the most beautiful Halong Bay caves. The French called Hanh Cave as Le tunnel, which means the tunnel. Hanh Cave is characterized by a very low entrance, so visitors need to go by boat. Hanh Cave is also the most beautiful cave in its length compared to the existing caves in Halong Bay. It is 1300 meters long, running through the rocky mountain of Quang Hanh to the sea. 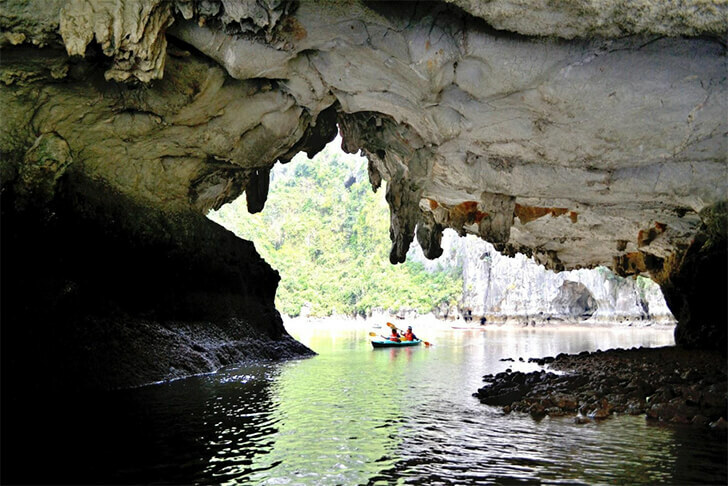 It attracts a lot of foreign tourists who love adventuring to explore Hanh Cave by kayak. 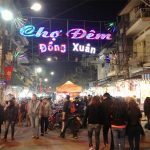 It can be said that visitors to Hanh Cave are the real explorers who love discovering the strange things and natural wonders left over. Sometimes, visitors can see colorful beams of rosins falling from the ceiling. The beautiful scenery only seen in the movie is available in the land of Halong. If you want to visit Hanh Cave, you can travel by the following way: Visitors can hire canoes from the Doan Wharf (in the area of Hon Gai, Halong) or car to Cam Pha town. Arriving at Cam Pha pier, visitors rent a boat or canoe. Near the gates, there are small boats carrying tourists. Tourists have to wait at the tide down to see the entrance. When entering the cave, you should have a torch or flashlight to see the road. The trip takes about 60-90 minutes. Luon Cave is located on Bo Hon Island, 14 km to the south of Bai Chay. In front of Luon Cave is Tortoise Islet, on the right is Heaven Gate. Luon Cave is located in the area with steep cliffs, clear blue water all year round. The cave is called Luon Cave because the cave is made up of a closed circle, in the middle is a lake connected to the sea by a tunnel whose bottom is the water surface. Luon Cave is nearly 60m long and its roof is 2.5m to 4m high, depending on the tide. When going into the cave, if the water is up, the visitors have to bend down "through" the cave. Perhaps that is the reason why it is called Luon Cave. When entering the cave, the cave dome has many beautiful and magical stalks to enjoy. After going inside the cave, visitors will come to a vast lake, surrounded by mountains and trees. 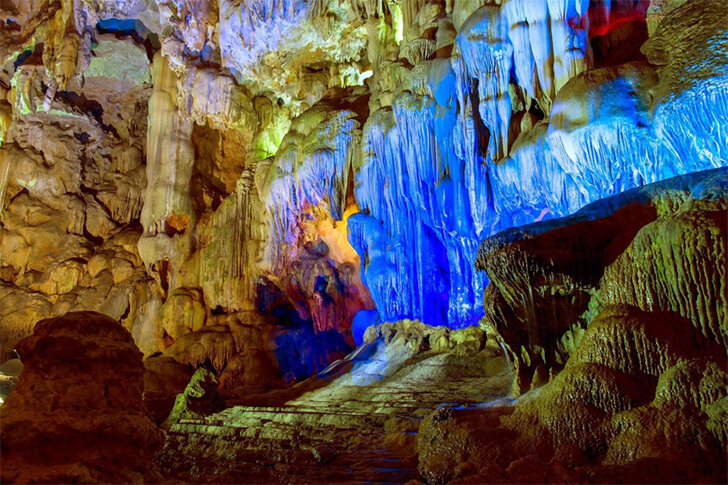 It can be said that the scenery in Luon Cave is as beautiful as the perfect painting of Nature. Not many caves like Luon Cave still exist in Halong Bay. 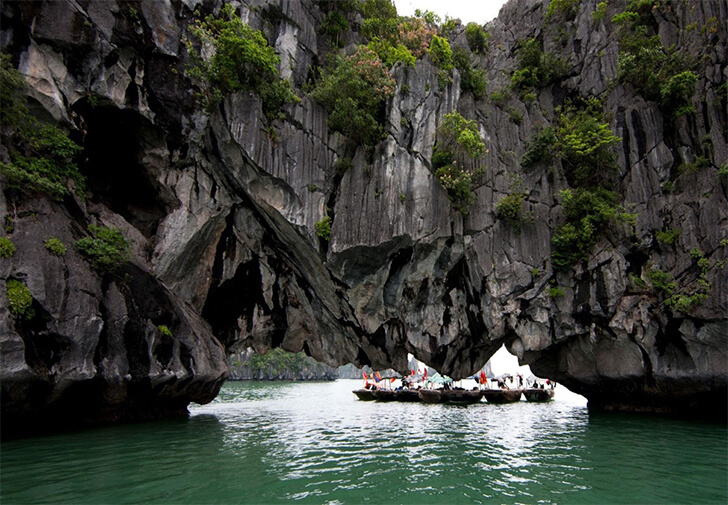 Therefore, this is one of the most beautiful and attractive caves in Halong Bay for tourists to visit and admire. Bo Nau Cave is located about 2-3km to the southeast of Trong Mai Islet. Bo Nau Cave is about 200 square meters in width. The cave bottom is wide and flat but not deep. Up to now, Bo Nau Cave still retains its pristine beauty. This cave, like the beautiful Halong Bay caves, has a lot of stalactites. The ceiling of the cave has so many cracks that the outside light can shine into the cave. As the legend, in the past, the local people took a cave to dye sail with brown berries, so it was called Bo Nau. In Bo Nau Cave, there is a stone chessboard with 3 fairies playing chess. Sitting in this area, visitors can admire the island and other beautiful scenery in Halong Bay. This is a very attractive corner for taking photos which creates the inspiration for many photographers. Bo Nau is also listed in the list of beautiful caves in the complex of most popular tourist attractions in Halong including Luon Cave, Sung Sot Cave, Ti-Top Island and Trong Cave. However, up to now, Bo Nau Cave has not been exploited much in tourism. Coming to Halong to visit the beautiful caves, you should not miss Bo Nau Cave.